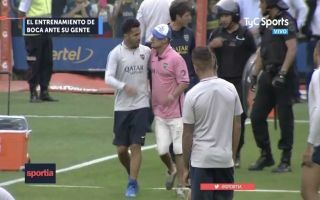 Boca Juniors striker Carlos Tevez stepped in to help an onrushing fan during a training session on Thursday after he was tackled by guards. The Argentine club are preparing for the second leg of their Copa Libertadores final against River Plate on Saturday, two weeks after the teams played out a thrilling 2-2 draw in the reverse fixture. Tevez could play a vital role for Boca in the showpiece event this weekend, but he might not have expected to be fanning the flames of trouble in the lead up to the game, as he did today on the training ground. During an open session at La Bombonera, a pitch invader broke through to try and have a moment with the players, before being swiftly dragged to the ground and held by security guards. Tevez immediately intervened, pulling the supporter away from the clutches of the staff and diffusing the situation, while also offering his training shirt to the man as a gift.